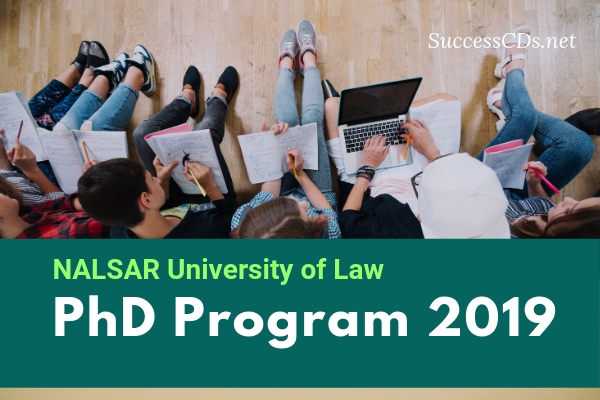 NALSAR University of Law PhD Admission 2019 - NALSAR University of Law, Hyderabad, an institution of eminence in the field of legal education and research, is a residential University established by the NALSAR University Act, 1998, (Act 34 of 1998) which is committed to innovation in legal education whilst expanding the frontiers of legal research. The University takes an interdisciplinary approach towards legal research encouraging students to look closely at the social moorings of law and the dependence on social science methodologies for legal research. Candidates who have passed the final examination of Institute of Cost Accountants of India. In case of candidates belonging to Scheduled Castes / Scheduled Tribes / Other Backward Classes (Non-creamy layer) / Persons with disabilities the requirement of marks at Master’s Degree is 50% or its equivalent. The University shall adhere to the National/State level reservation policy as applicable. The General seats have been earmarked for subjects other than the aforementioned specializations. Proposals in other specialized areas may be considered subject to availability of faculty and area of interest. Admissions against the aforesaid vacancies shall only be made if a research proposal is found to be satisfactory and suitable. The University reserves the right not to admit candidates in any specialization if the proposal is not found to be research worthy. In order to obtain admission, candidates have to appear in a written entrance exam test. This year the exam shall be conducted on Saturday, June 8, 2019 at 11.00 a.m. at NALSAR University Campus, Justice City, Shameerpet, Hyderabad. The entrance test will have two parts. The first, for 50 marks is devoted to assess aptitude for research and writing skills and the second also for 50 marks evaluates disciplinary background and domain knowledge. The first part is mandatory for all applicants irrespective of their disciplinary background in order to testability to write professionally and in accordance with established norms of scholarship. The candidates can do the second part by attempting questions under Law, Social Science and Humanities or Management. The applicable relaxation as per UGC will be taken note of. The applicants who have cleared the entrance test with 50% score as qualifying marks and also those who are exempted from writing the entrance test are required to submit a preliminary research proposal (between 1500-2000 words) with a statement of the research problem and a literature survey which demonstrates that the research topic is unexplored and an original scholarly contribution can be made on the same. Applicants may contact the Research Advisory Board whose contact details shall be provided on the university website for consultations on their proposals. The applicants are required to visit the University website to ensure that proposals on already registered topics are not submitted. The preliminary research proposals will be scrutinized for plagiarism. If the similarity index for any proposal exceeds 15%, excluding appropriately cited sources, then the applicants will not be called for the interview. Similarly, applicants making proposals on topics already registered with the University may not be called for the interview. The applicants whose preliminary proposals are cleared in the plagiarism test will be required to attend an interview before the Research Committee The applicants who clear the interview will be provisionally admitted to the Ph.D. programme and will be required to attend the Research Methodology coursework conducted by the University. The Research Committee will allocate a Principal Supervisor for each candidate. In appropriate cases a candidate may be allotted a co-supervisor who may or may not be NALSAR Faculty member. The candidates will compulsorily undergo a Foundational Research Methodology course and after successful completion of the Research Methodology coursework, and the additional course work, candidates will be required to defend their modified proposal before the entire Faculty. The candidates who have cleared the entrance test, but did not clear the interview shall be given one more opportunity to submit their proposal on the basis of the recommendation of the Research Committee without needing to reappear for the entrance exam. Enrolment for the Ph.D. programme shall ordinarily be full-time. A candidate enrolled for full-time shall put in a minimum of two years residence of which at least 18 months shall be in the University. Candidates pursuing the Ph.D. programme on a full time basis may assist in the teaching or research activities of the University. Candidates pursuing the Ph.D. programme on a full time basis are expected to complete the requirements within three years for the award of the degree. Provided that where candidates pursuing the full time Ph.D. programme are able to submit a thesis of requisite standard and quality in less than the mandated period, then the University may permit an early submission with reasons recorded in writing. The Research Committee shall retain the discretion to grant one additional year for the completion of the thesis. In the event of the inability to complete the requirements within four years of the date of enrolment, the candidate will be required to convert the category of enrolment to a part-time one. Candidates can also enroll for part-time Ph.D. programme. A part-time candidate shall put in a minimum of four years including time spent for research at any other location with the permission of the Principal Supervisor. Six years shall be the maximum period in which the part-time candidate shall complete the research work and submit it for evaluation. In the first component the examination will test the research and writing aptitude of the candidates through essay, comprehension and précis writing. Candidates will also be tested on their ability to write professionally and in accordance with established norms of scholarship through questions which test the candidates knowledge of the where, what and how of referencing. All correspondence relating to admissions should be made to the Registrar. The Application Form can be downloaded by Clicking Here and the filled in form should be sent along with a Demand Draft for Rs.2,000/- (Rs. 1,000/- in case of S.C. and S.T. candidates along with Caste Certificate) in favor of “Registrar, NALSAR University of Law” payable at Hyderabad. Or by making online payment by clicking Apply Online of Application fee. The duly filled-in form must reach the Registrar on or before May 31, 2019. Applications received after the last date shall not be accepted. The University reserves the right to revise the pattern of the admission test, procedure for admission and fee structure.